These set of Tasks are unlocked after completing 20 tasks in Chapter 2 - Crazy Eights. The Golden Fan is obtained via the Challenge Mode Tasks. 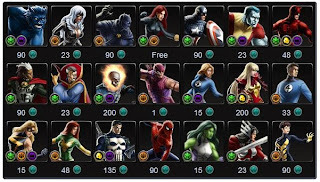 The Side Tasks requiring the use of Shatterstar, Magik, Daredevil, Hank Pym, Fantomex and Punisher in combat can be done without recruiting them during their respective Team Up Missions in Chapter 3. Punisher is not an Epic Boss Deploy Hero requirement but is required to unlock the Premium Mission that has the Epic Boss. Invisible Woman, Ms. Marvel or She-Hulk can be recruited for free during Chapter 1 - The Pulse, but only one of them can be chosen. Punisher can be recruited for free during his respective PVP Tournament. 3 Tasks Completed: 1 New Mission Available! Season 2 3-2 Unlocked! 7 Tasks Completed: 1 New Mission Available! Season 2 3-3 Unlocked! 11 Tasks Completed: 1 New Mission Available! Season 2 3-4 Unlocked! 15 Tasks Completed: 1 New Mission Available! Season 2 3-5 Unlocked! 20 Tasks Completed: 1 New Mission Available! Season 2 4-1 Unlocked! Test Subjects have been experimented on without their consent, granting them super powers at the cost of their minds. They can be found in Missions 1. Spiculum, Cusptero and Sicuspcis can be found in Mission 2. Maggia and HYDRA henchmen are roaming the streets of Mission 3: Capo Crimine. BL-DELTA Test Subjects can be found in Mission 4: Growing Pains. Sentinels can be found in Mission 5: Techno Illogic. Mephisto is the Boss in Mission 5: Techno Illogic. Maggia Captains and HYDRA Burners can be found in Mission 6: Punishment. Initial Hints: These set of Tasks are unlocked by finishing Missions. Shatterstar is the team up in Mission 1: Shattered. Blade Maelstrom is Shatterstar's first ability. Shatterstar is the team up in Mission 1: Shattered. Incursions are battles against Heroes from alternate realities. They might look like the Heroes you know, but they are not. They threaten our world as surely as any villain. Magik is the Team-Up in Mission 2: Gates of Hell. Unleash Hell is Magik's second ability. Magik is the Team-Up in Mission 2: Gates of Hell. Heroic Battles are classic matchups between Heroes and Villains. To participate, you must have that hero recruited. Daredevil is the Team-Up in Mission 3: Capo Crimine. Radar Sense is Daredevil's second ability. Daredevil is the Team-Up in Mission 3: Capo Crimine. Hank Pym is the Team-Up in Mission 4: Growing Pains. Growing Pains is Hank Pym's first ability. He is the Team-Up in Mission 4: Growing Pains. Selene is the opponent in the Heroic Battle in Mission 4: Growing Pains. Fantomex is the Team-Up in Mission 5: Techno Illogic. Allons-y is Fantomex's second ability. Fantomex is the Team-Up in Mission 5: Techno Illogic. Ultron is the Epic Boss in Mission 5: Techno Illogic. Punisher is the Team-Up in Mission 6: Punishment. CFJ-15 Assault Rifle is Punisher's first ability. Punisher is the Team-Up in Mission 6: Punishment. Sin is the Epic Boss in Mission 6: Punishment. These set of Tasks are unlocked by selecting Challenge Mode on their respective Missions. It is not required to finish a Challenge Mode Task in order to unlock the next Challenge Mode Task as more than one Challenge Mode Tasks can be active at a time. Challenge Mode Tasks do not count towards the main Story Task Progress but only count towards the Challenge Mode Story Task Progress. Players cannot engage in Challenge Mode if they are playing the Mission for the first time. Challenge Mode grants full XP rewards, and better rewards than normal missions, but the difficulty increases. Daredevil's Radar Sense is stuck, don't know how to finish this ???? I play it two times and only find one... And four maggia capitain. Hydra burners can be found in Mission 4 instead of 6. I have played Mission 6 for 4 times but just no burners. But in Mission 4, when you start the mission fresh there are 2 low threat missions and one of them contain Hydra minions. If you lucky there should be two burners. If not just abort and restart. 1. Equip any Blaster Phoenix uniform socketed for attack and evasion. I used 8 Skillful, as well as the e-iso that grants soothing rest. 2. Attack the Hydra solider first with Psi-blast. This will allow Mind Link to be applied to the soldier, and he will protect you from Selene's attacks. 3. Until Mind Link refreshes, attack Selene, either with Psi-blast or Telekinesis. But if Selene uses Skia Thanatou, its over, you lost. I won once, but i cannot do the 30000.
do you only can win with 30.000 points if u use phoenix uniform ? I made it but just got 24.000 ... and btw its just fucked up if u can defeat the second epic boss because you need ghost rider and beast = 290 cp ... or u need other heros u dont have for another deploys... just a fucked up thing ... I have around 57 heros and play several hours a day and I dont make it to get them all though... because if u have enoug cp then u buy one and another hero will be announced soon ... playdom should give some gifts around christmas... like gold or cp. how do you win on season 2 chapter 3 mission 5 the hero battle against Ultron? @al el dul Same issue! I also try to defeat Hydra Burners in other missions, but it doesn't work! Regarding Phoenix challenge, level her up to 13 and you get it easily (specially if you have those extra iso-8s). For the Hydra Burners, Mission 4 is very good, indeed! Any suggestions on defeating Ultron above 45000? @asia if you have the soothing rest empowered iso make sure mr fantastic is equipped with it. Start with using his level 1 attack on dr doom and then level 9 attack on the doom bot. Next turn use level 2 attack on dr doom and then recharge which will also give you some health from the soothing rest iso. Repeat those steps as many times as possible and you should win the battle. any suggestions on Heroic Battle Mission 6 - The Punishment ?? Do I have to equip both Spiderman and Black-cat with Scapper to beat those damned hell Maggia ? I used claws black cat (10) and future spiderman (11) both as infiltrator and had no problem. scrapper BC should be close to her claws suit (2 bleeds vs 3). make them bleed fast and a lot then use dice and level 9 ability. Defeat Selene with a Score over 30000.